Life can be quite the pitcher. And some people seem to constantly get thrown crazy curve balls that make them strike out and feel frustrated. Instead of giving up, sometimes you just have to learn how to let some things roll off your back. As gross as the saying sounds, you need to develop thicker skin or you’ll risk getting emotional wounded at the drop of a hat. 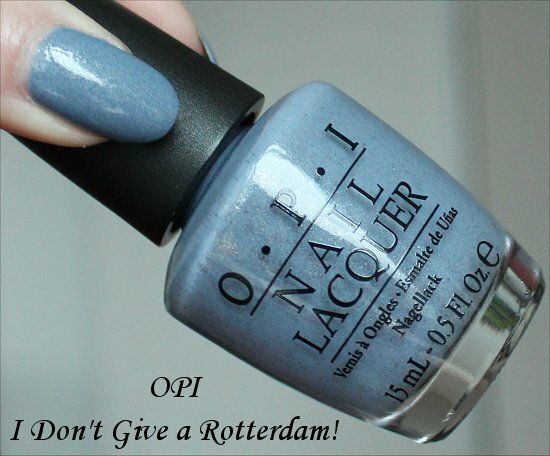 OPI I Don’t Give a Rotterdam! from the new OPI Holland Collection for Spring/Summer 2012 not only has a funny name that’ll make you smile, but it also serves as a great reminder that when life hands you lemons, be glad that you’re not a lobster! 3 coats of OPI I Don’t Give A Rotterdam! Name: OPI I Don’t Give a Rotterdam! I Don’t Give a Rotterdam! 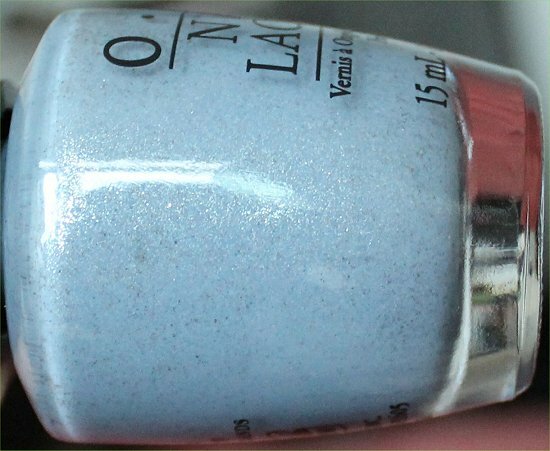 by OPI is a sophisticated dusty blue done very well. 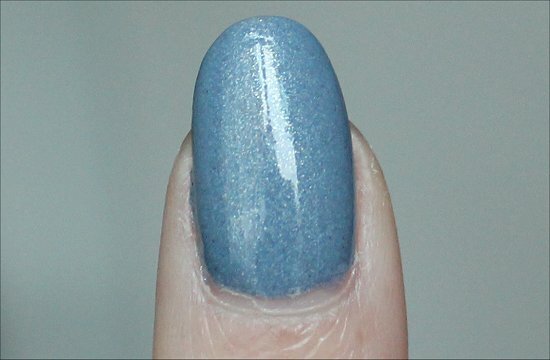 It’s really easy for dusty blue polishes to look old or dull, but this one looks very classy and still fresh. The colour reminds me a lot of jeans…like your favourite pair that you throw on at a moment’s notice when you want to be comfortable, but still look great. 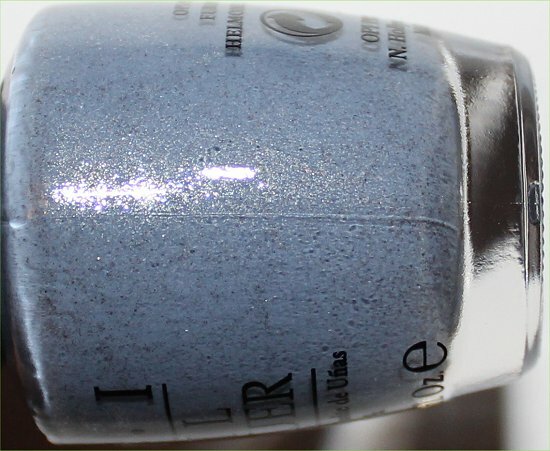 This lacquer is very easy to wear and has a polite, demure personality that is quite charming. As you know, I’m fond of loud and flashy colours, but when I sport something more subtle, I really like shades like this that still make a statement, so they don’t leave you bored to tears. If you’re the opposite of me and tend to wear more neutral or subtle shades, but want to branch out into the bolder territory, OPI I Don’t Give a Rotterdam! is an excellent choice to ease you into wearing blues. Also, the shimmer sometimes looks a bit golden to me, but in other lighting, it sometimes looks silver. In reality, it’s probably champagne, which is why it seems to shift so much. I Don’t Give a Rotterdam! by OPI went on pretty sheer with just a single coat. Two coats provided a lot more coverage, but I opted to use three only because I wanted to see if it made a big difference. I tend to use medium coats, so at just two coats, it was fully opaque to the naked eye. The third coat didn’t seem to add anything extra. The formula was easy to control, but it wasn’t anything special. I didn’t think it was the best formula I’ve ever worked with, and it was far from the worst. Pretty average – middle of the road. I can see myself wearing OPI I Don’t Give a Rotterdam! many times because I don’t have too many dusty blues, and this is one of the better ones in my collection. Plus the shimmer is what really sets it apart from the others. Are you a fan of dusty-coloured polishes? Have you tried wearing hues outside your comfort zone? If so, was it a pleasant experience? 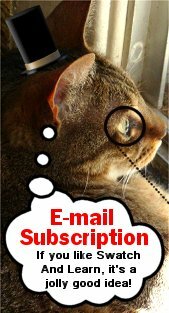 This entry was posted in Nail Polish Swatches & Reviews, Product Reviews and tagged OPI on February 6, 2012 by Mary S..
You know what? I love grey and black jeans, but it’s very strange…they seem to always be made of a different fabric or the cut is different and doesn’t fit me. With blue jeans, it’s easier for me to find something that fits, although maybe that’s just because there are more blue-jean options. What silhouette do you normally go for? I normally gravitate toward the Artist jeans from American Eagle Outfitters, although I have a couple of pairs of leggings that I like to wear with knee-high boots. Hope your ankle continues to heal! Rest up and get better soon! I tend to buy boot cut or flare jeans from Bluenotes but sometimes Old Navy and Wal-Mart. I also wear jeggings, I have a blue pair from Wal-Mart and a black pair from the Miley Cyrus and Max Azria collection. The only thing I don’t like about jeggings is that they don’t ahve belt loops. My black jeans fade more easily than my blue jeans but I still like black jeans better. When I saw the collection at the store, I thought I could pass… but now this blue looks interesting. It’s way outside my comfort zone, but I could try. Thanks for sharing! This blue is definitely different than a lot of blues on the market. It’s the shimmer that I feel gives the dusty hue some life. 🙂 If you try it, please let me know how you like it! Great post! I’m loving this colour and the names in this collection. 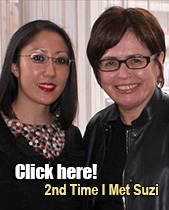 Your photos are great too, thanks for posting! Thank you so much for taking the time to leave me a comment! 🙂 I’m so glad that you appreciated the photos and like this colour as much as I do. Hehe, yes, promotional pictures can often be so deceiving, can’t they? More often than not, I find that colours look 1000x better in person, but it’s still nice to get a glimpse into a collection before it drops. Do you remember any crazy, weird, or fun polish names that you’ve come across that made you want to buy the polish? I’m curious! I love this dusty blue! This one & I Have a Herring Problem are my favorites from this collection! Happy belated birthday! 🙂 Hope you had a blast! What did you do to celebrate? Dang! I was gonna be good, but this color makes it tough. I’ve already called my supplier and the Holland Collection isn ‘t in yet, but looks like this will be one of the irresistable ones. My supplier called, so I slipped down the hall to see the goodies. They won’t be available for purchase until the 8th, so they let me put back a few bottles to purchase when they open that day. 1 Did You ‘ear About Van Gogh? 1 Wooden Shoe Like to Know? I was a bit disappointed in Thanks a Windmillion. It was seriously on my list until it turned out to be not quite swampy enough and gave me Mermaid’s Tears flashbacks. I’m dancing right there with you! 🙂 Your excitement is infectious! YAYYYYYYY! That’s awesome how you were able to put all the ones you like on hold. 🙂 Hope you love them. This one is one of the ones I’m hoping to get from the Holland collection and these swatches certainly did not disappoint! This shade of blue reminds me of blue jeans as well. I like the shimmer–in fact, I like shimmery polishes in general as shimmer really adds depth. Right now the polish I’m wearing–OPI Tease-y Does It–is definitely out of my comfort zone, as it is the darkest polish I’ve ever worn, but it has a touch of reddish shimmer that makes me really like it and want to wear it again. Glad to see that you’re trying something outside your comfort zone and that you like it. 🙂 OPI Tease-y Does It is a pretty shade. I don’t have it, but Nubar Raspberry Truffle’s in my collection, and people have said that they’re very similar. I’m definitely a lover of dusty shades!! This is a really great looking polish. Love your swatches Mary! 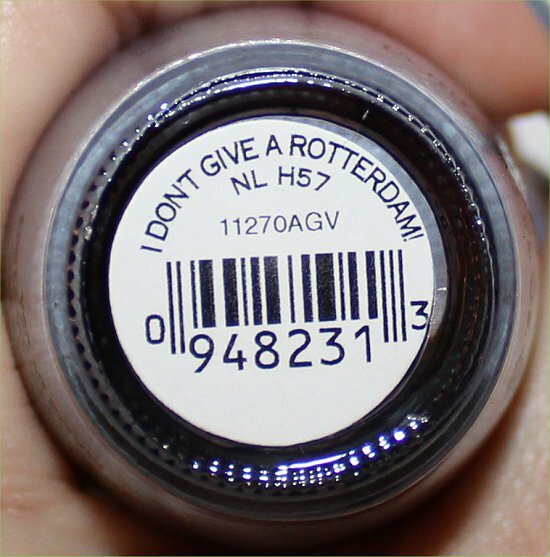 This wasn’t one of the polishes on my list from the Holland collection, but I just might have to add it now :-/. I actually ended up getting I Have a Herring Problem because looking at them together, I preferred that color. Honestly, I wanted them both, but decided to choose one because they were so close. Knowing me, it’s only a matter of time before I just get this one also, lol. Carmela recently posted: CND Tutu banishes Monday blues with childhood nostalgia. I totally thought of you and Marta wearing this colour when I first wore it! Okay, we’ll coordinate then. 😉 Hahaha! Yes, the Colors from the Capitol Collection is amazing! 🙂 Definitely save up for that! I’m a huge fan of this color and I can’t wait to get my hands on it, along with other colors from the collection. I had wanted Zoya Skylar which looks pretty similar, but when I changed my mind when I found out the OPI was a dupe, only because I can find them easier and get them for cheaper. I think the names are pretty cute too! Melissa recently posted: Flaky experimenting & Vampire’s Blood revamped! This collection has so many interesting shades. 🙂 Oh, I had no idea that Zoya Skylar is similar to this. That’ll help someone get hold of the colour who can’t find this OPI one. Yay!!! You got this one. It’s so gorgeous. My swatches made I Don’t Give A Rotterdam and I Have A Herring Problem look almost identical. Did they send you the whole collection? I only have 6 of the colors but might get a couple more.